Ex-Time Projector Watch | OhGizmo! By Evan Ackerman on 10/02/07 • Leave a comment! When everybody needs to know what time it is, you either need to be Flavor Flav, or you need a watch with a projector in it. 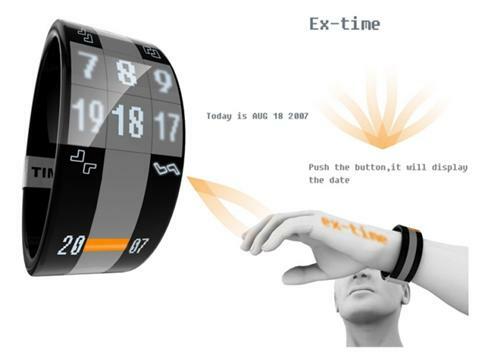 Ex-time, by designer Rong Yong, is able to project the time onto your hand or arm with the push of a button. It also displays the scrolling time and date on the otherwise unremarkable surface of the watch at the push of an equally unremarkable button. 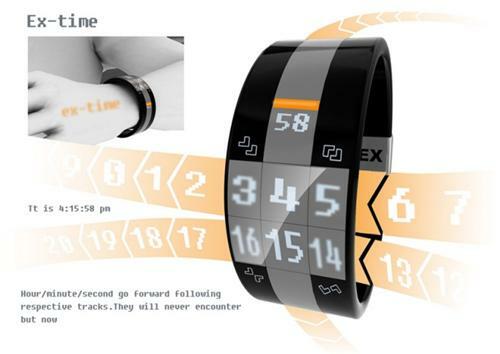 I do kinda like the wristband style and the fact that it’s flat, and the projector would be cool (albeit mostly useless). But it doesn’t matter because, of course, it’s only a concept.